The headwaters of Porcupine Creek in the Haines Borough of southeast Alaska is an unnamed glacier. Gold Rush Glacier is the name applied here, since there are many Porcupine Creek’s in Alaska but only one featured on the excellent Discovery Channel show Gold Rush. Gold Rush Glacier is comprised of an eastern and western glacier that in 1986 joined at the terminus. 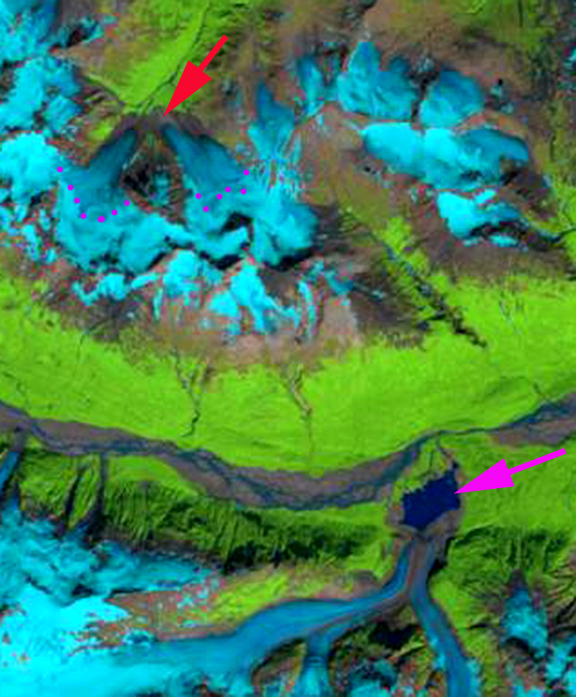 The glacier begins amid a series of peaks from 1500-1650 meters, and descends to 975 m.
Landsat imagery from 1986, 2004, 2010 and 2014 along with Geoeye imagery from 2011 and 2012 are utilized here. 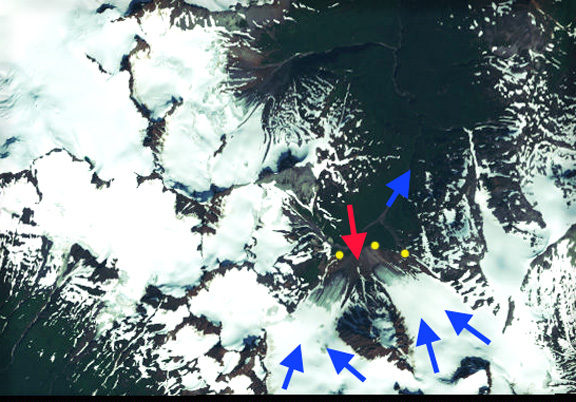 In 1986 the east and west termini of Gold Rush Glacier meet at 950 m, red arrow, melt water is released into Porcupine Creek, blue arrow. 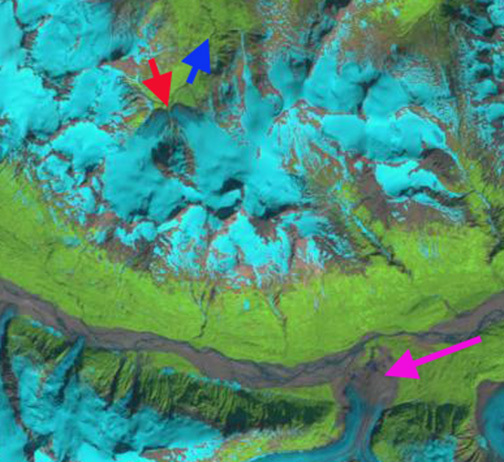 In the next valley south is The Tsirku River, flowing into it is the LeBlondeau Glacier, pink arrow. 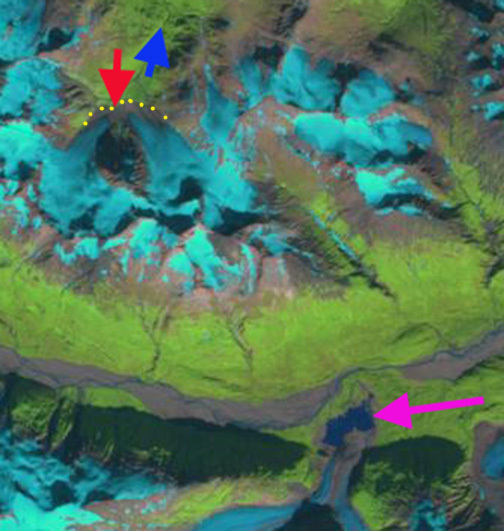 This glacier emerges from the mountains onto the valley bottom and the terminus spreads out. In 1986 there is no lake at its terminus, pink arrow. By 2004 the Gold Rush Glacier termini have separated and a lake has formed on the west side of the LeBlondeau Glacier terminus. The snowline was very high in 2003-2005 in southeast Alaska, and is marked by black dots in this image. The glacier needs to be more than 50% snow covered at summers end. This image is from late August with 3-4 weeks of melting and already only 30% of the glacier is snowcovered. In 2010 the Gold Rush termini are separated by 300 meters and the glacier has retreated from the trimline, yellow dots of the 1980’s. 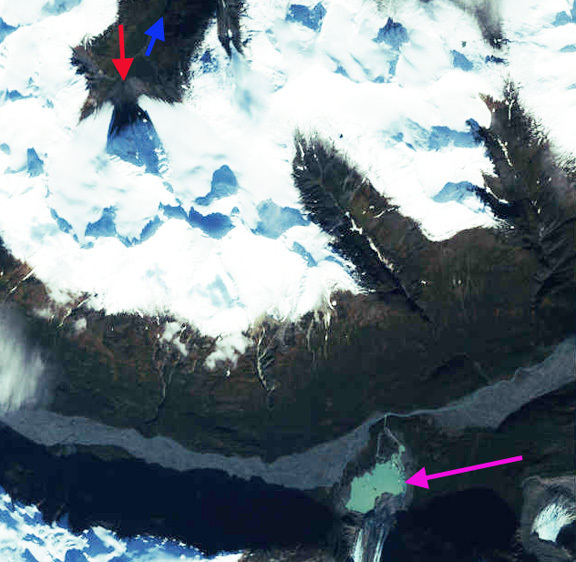 LeBlondeau Glacier has developed a lake across its entire front. 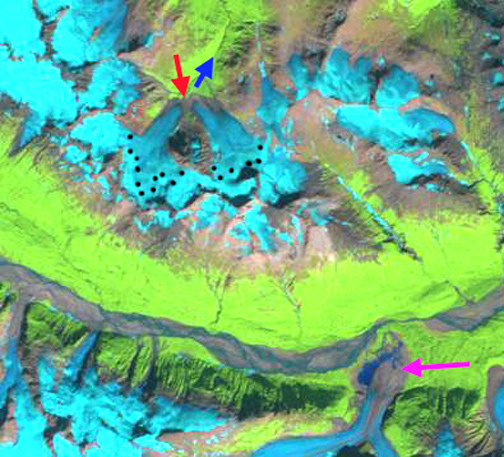 The 2011 image indicates the glaciers as nearly all snowcovered in late September as the winter season begins. The melt season at 1000 meters in this region typically is over between September 10th and 20th. The lake at the end of LeBlondeau Glacier is now 1100 meters east to west and 500 meters across. In 2012 the termini of Gold Rush Glacier have retreated 350 meters from the 1986 position and are 400 meters from each other. In 2014 the terminus lake at LeBlondau Glacier has continued to expand from 2010 and the snowline on Aug. 2 with eight weeks left in the melt season is quite high on Gold Rush Glacier. 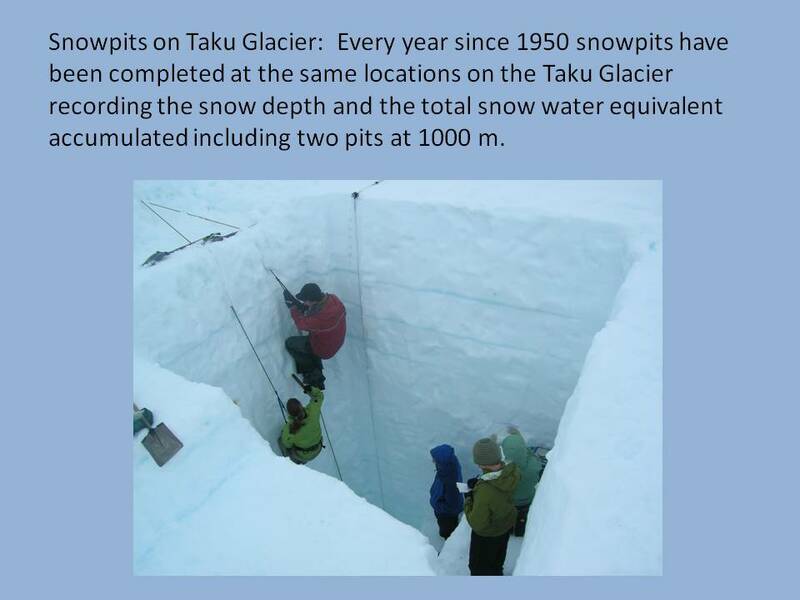 The key for Gold Rush Glacier survival is maintaining sufficient snowpack into August in its main accumulation basin 1250 meters. There has not been much accumulation retained here in 2013 or 2014. Having completed lots of snowpits (last image) in the summer on Southeast Alaskan glaciers the snow depth in early July needs to be more than 2.7 meters to survive the summer melt, last image from Chris McNeil. As of Jan 26 2012 the National Operational Hydrologic Remote Sensing Center is indicating five feet of snow on the Gold Rush Glaciers with 0.4 m of snow water equivalent, this is close to average. Two valleys and kilometers east is Little Jarvis Glacier. This glacier was surveyed in 1957 and 1995 and found to have retreated a modest 190 m and thinned very little except right at the terminus (Sapiano et al, 1998). Gold Rush Glacier experienced a minor retreat of less than 100 meters from 1957-1986. This indicates that the Haines Borough glaciers saw modest changes until the 1990’s. Gold Rush Glacier has been retreating in a less spectacular fashion to the nearby larger Brady Glacier and Riggs Glacier but similar to the comparably sized Lemon Creek Glacier. 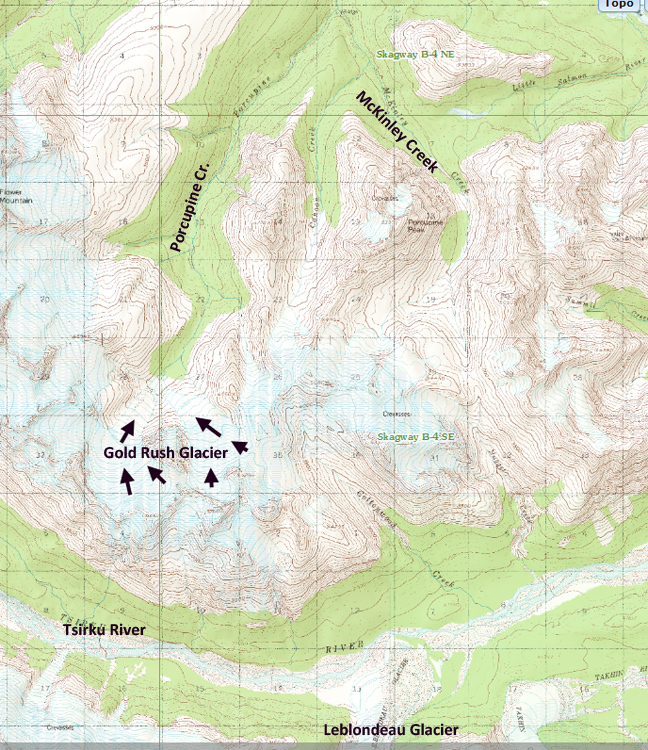 This entry was posted in Glacier Observations and tagged Gold Rush Glacier, Gold Rush Glacier Retreat, leblondeau glacier retreat, leblondeau lake formation, Porcupine Creek Alaska Glacier retreat. Bookmark the permalink.